3carrots, beets, or radishes will also work. 4*Decide if you want to peel the zucchini or not.If you want a more authentic looking noodle:peel.If you want to add a little more color: don’t peel! 5*You can use a spiralizer, spirooli, mandolin or vegetable peeler to create noodles with your vegetables. 6*If using a vegetable peeler to create noodles, go lengthwise along the zucchini to produce long flat ribbons.Once you reach the seeds turn the zucchini and begin slicing the other side.The seeds will prevent the ribbons from holding together. 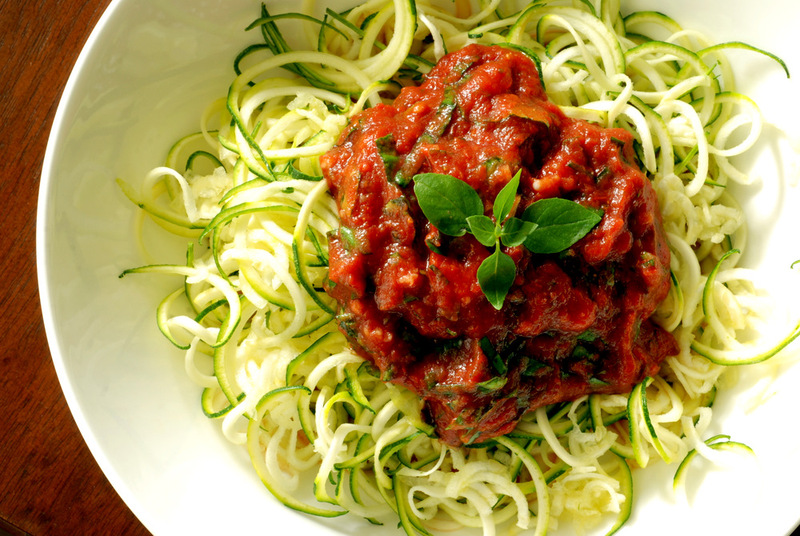 7*Make small stacks of the zucchini’s and slice along lengthwise to create your noodles. 8*If using a mandolin, be sure to use the julienne style cut. 20For a smooth marinara place all ingredients except fresh herbs in a blender. 21*Blend for 1 to 2 minutes adding the sundried tomato soak water to reach your desired consistency. 22*Taste, add more salt or lemon if needed, then add your fresh herbs and blend briefly to mix the herbs into the sauce. 23*For a chunkier marinara you can use your food processor. 24*Add all ingredients and pulse adding a little sun dried tomato soak water as need to reach your desired consistency. 25Mix with your noodles and ENJOY your fast fabulous fresh creation! !